This is a Texas State quarter that has been cut into 2 necklaces. Each showing the state and the star. 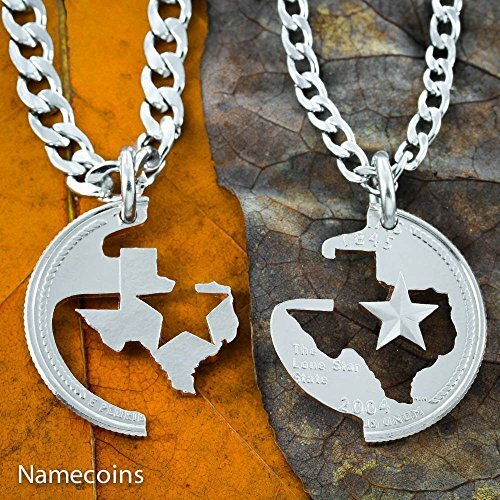 Its the coolest his and her necklace ever for anyone who is proud to be a Texan. They are hand cut from the same coin and both sides interlock perfectly together like a puzzle. This is a unique gift unites couples or friends. Its fun because when you wear them you have to be close to put the two sides together and it reminds you of each other when apart. Your order will include two very strong and smooth stainless steel chains or key chains. If you like our work check out our Facebook. We regularly post new designs and answer any questions. Message us if you have questions; we love helping people create the perfect gift. If you have any questions about this product by NameCoins, contact us by completing and submitting the form below. If you are looking for a specif part number, please include it with your message.